Toasting barrels at Radoux, Windsor, Ca. SONOMA COUNTY, Ca. – Is there anything better for a wine geek than waking up on a Thursday morning knowing you’re going to spend the day in the Russian River Valley tasting Pinot Noir? In planning for this trip I wanted to make a visit to Kokomo, Indiana’s Erik Miller. Erik is owner winemaker for Kokomo Vineyards in the Dry Creek region of Sonoma. We finally got together on a quick phone call and he invite Drew and I to join members of his Wine Club at a barrell making demonstration. Of all my wine experiences in the four years I’ve been wine writing, I’d never seen the process. I certainly came away from our visit to Tonnellerie Radoux, Windsor, with a new appreciation for those oak barrels. 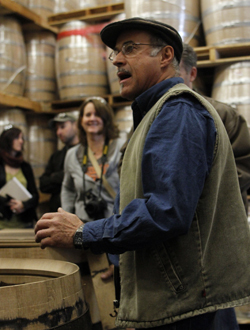 The variables in how coopers can mix the oak and watching the hand craftmanship was fascinating. 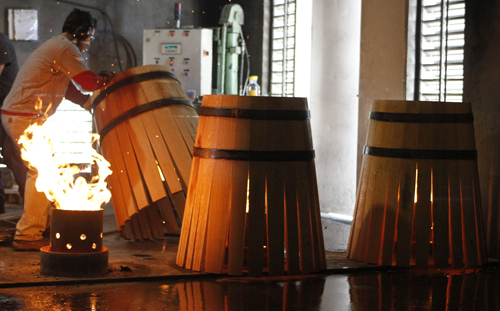 That mixture of oak plays such an integral role in how the oak win interact with the wine for the final product. Radoux’s Master Cooper Francis Durand led us through the plant demonstrating each step of the process. This will be a future newspaper column but really enhanced my knowledge of oak and it’s sophisticated role in winemaking. After the hour-and-a-half tour, we hopped in the car and drove the 20 minutes up Ca. Highway 101 and Dry Creek Road to Kokomo Winery. Eric greeted us with fourth-generation vineyard owner and manager Randy Peters. There is no better education than walking the vineyards with the grower and winemaker for those who really want to know more about wine. We visited several blocks of the vineyards at the winery, talked about the dry Sonoma winter, pending bud break, and all of the things to get a wine geek all geeky. In the tasting room Drew and I enjoyed the Sauvignon Blanc, a Cab, a really nice Pinot Noir made from Gary’s grapes near the Sonoma Coast, and two Zins. The 2009 TimberCrest Zin was one of nicest I’ve tasted in a long time. Dry Creek is known for its Zinfandel. But the area can also grow almost any varietal, it’s that variety that intriques Miller. We had a great chat with Erik and Randy which will turn up in a future newspaper column or two. And yes, for those who don’t know, Erik did name his winery after his hometown of Kokomo, Indiana. Our final stop of the day was a hastily arranged visit to one of Sonoma’s best, Chateau St. Jean located betweent he cities of Sonoma and Santa Rosa on CA. 12. Our friend and host Stephen Pavy, Joseph Phelps Winery, put in a call to the St. Jean tasting room and a couple of tasting room hosts led us through a really nice tasting of their reserve wines. Newbies need to know or keep in mind even wineries like Chateau St. Jean, which is available in Indiana and all 50 states make premium wines with limited distribution or available only at the winery. We tasted a great Pinot Gris, two Chardonnays, a couple of Pinots, and their signature Bordeaux style blend Cinq Cepages 2008. The highlight for us was the Sonoma County Reserve Merlot ($90) and Sonoma Reserve Cabernet ($90). The Cabs in Sonoma are generally a little lighter than the Napa powerhouse Cabs. But the beautiful balance and silkiness of these wines would please most any palate. 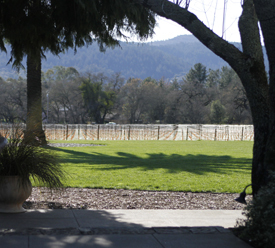 Chateau St. Jean is a great stop and any Sonoma trip should include a visit. The grounds are truly stunning. They have a tasting room for their other wines which range in the mid-teen to $20 pricepoint. So it’s off to the Russian River Valley this morning.. We start our day with two of the grand ladies of California wine. Our first stop is at Merry Edwards and second at Inman Family wines. Kathleen Inman is going to pour for us her Pinot. 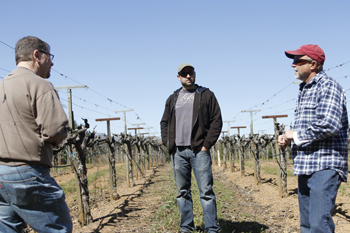 Ted Klopp, a Wabash College grad, provide Pinot grapes from his ranch to both producers. We’ll see Ted this afternoon. If we don’t run out of time, we hope to pay a visit to the iconic Rochioli Vineyards later today. 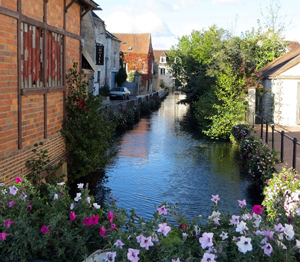 NOTES from the road: I do have many more wonderful photos taken by Wabash College senior Drew Casey who is along with me on the trip. The loading times are taking forever! I did get all but one or two photos from Tuesday up this morning. Just click on the photo image at upper left and scroll down to Napa Day photos. I hope to get yesterday’s up this evening.